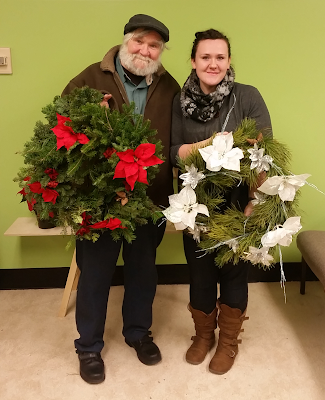 Bill and Cassandra Sanborn pose with the wreaths they made at OneTree's 2015 event. OneTree Alaska will offer three opportunities in December to make holiday wreaths and ornaments from local forest materials. The activity will be offered from 11 a.m. to 3 p.m. on two Saturdays, Dec. 10 and Dec. 17. It will also be offered from 2-6 p.m. Friday, Dec. 16. All three events will be in OneTree’s community forest science center in the former kitchen of Lola Tilly Commons at the University of Alaska Fairbanks. The entrance is on the west side of the building. Families are welcome. The wreaths will include boughs donated by the Fairbanks Kiwanis Club. The materials fee is $20 and a surcharge will be added if someone wants to make an extra-large wreath. A prorated rate will be offered to families. No registration is required. OneTree Alaska is a forest education, research and outreach program of the UAF School of Natural Resources and Extension. For more information, contact OneTree Alaska at 474-5517.